It is possible that lead was mined in the area around Llangollen as far back as Roman times. Certainly in 1696 Edward Lhuyd, in his travels around the area, said that lead was “previously mined at Fron Lwyd” in the Eglwyseg Valley. Mining leases from the 18th century show lead, copper, calamine, coal and other ores being mined. Slate too has been quarried since before 1700. The Clogau Quarry was established in 1690 and Edward Lhuyd recorded hearing blasting from the Moel y Faen Quarry in 1696 and refers to slate being sent from the Oernant Quarry to the next county. Other quarries, such as the Aber Gwern Quarry, the Eglwyseg (Pant Glas) Quarry, the Wynnstay Quarry and the Ffynnon y Gog Quarry all operated in the 18th and 19th centuries. Work started at 7.30am and was physically hard. It could take up to 8 hours to hand drill a single hole for a blasting charge. Breakfast was usually porridge and bread - cheese and ham made up dinner. Quarrymen brought their own tea and sugar in small tins. The day finished at 5.30pm and was often followed by a long walk home. Wages in 1800 were 6 shillings (30 pence) per week. The Berwyn Slate Quarry was opened as the Clogau Quarry in 1690 and belonged to the Wynnstay Estate. The quarry was, and still is, used to produce large slabs, for hearths, worktops, tombstones and billiard tables. 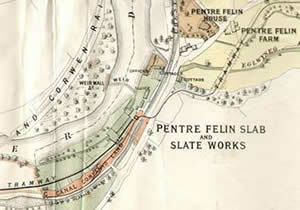 The large blocks were transported to the slate works at Pentrefelin (see map right) and, after finishing, were loaded onto canal barges, and later railway freight cars, for transport. At the height of its operations the quarry employed several hundred men. Purchased from the Wynnstay Estate in 1950, the quarry today employs 4 men. Opened around 1700, a map from 1868 shows the Moel y Faen Quarry belonging to the Wynnstay Estate. 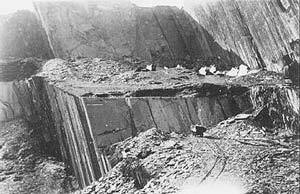 Producing mainly roofing slates the quarry employed over 600 men at the height of its activity in 1871. 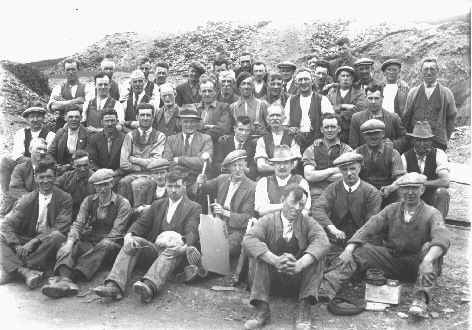 On the right are shown quarry workers at the Moel y Faen quarry in 1923. 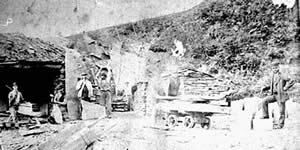 By 1931 the number had dwindled to 126, but the quarry continued to operate for another 20 years. The Rhiw Goch Quarry in Rhewl was once a major employer in the area. 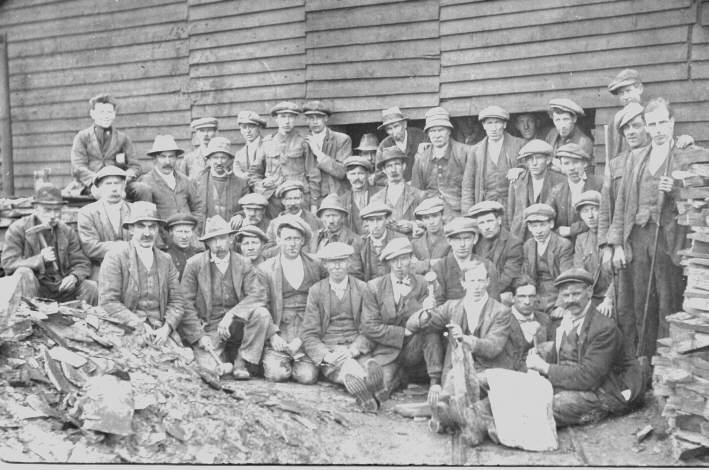 By the 1880s there were only 6 rockmen living in Rhewl and they were not necessarily working at the Rhiw Goch. The quarrymen had to collect their wages from the Bull Inn in Llangollen. Having walked sometimes up to 5 miles home they would have a meal and then walk another round trip of 6 miles to Llangollen and back to get their money. In later years when the quarry propspered transport appeared on the scene and men were taken to whichever quarry they worked at. The Pant Glas slate quarry is marked on the 1844 tithe map as a wooded area called Caer Pistyll (Field of the Waterfall). The quarry must have opened soon after, however, as a map from the middle of the 19th century shows a proposed tramway to link the Pant Glas Quarry with the Clogau tramway. The tramway was never built, but old photographs (see right) show the quarry still in operation in 1881. 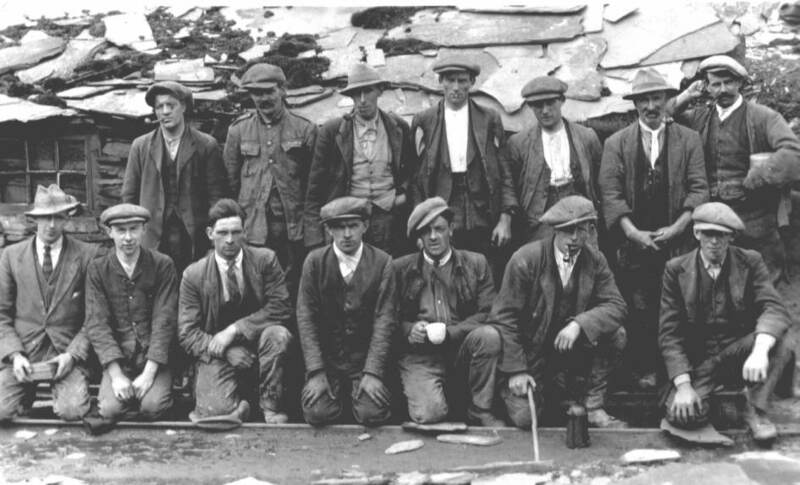 The quality of the slate in this quarry was poor, and the men found it difficult to make a living. At the start of the 20th century they began to leave, and by 1930 the quarry was in crisis. However, a Manchester gentleman took it over and the quarry expanded again, employing up to thirty men. The quarry was worked in a different way and produced, so it was said, the best slates in the country. Two years later the owner was taken ill and died, causing the quarry to close. The photograph shown here was taken in 1934 and must have been shortly before the closure of the quarry.